I'm sorry my lack of presence on this site. I wish I had a great excuse. I really meant to post right after quilt market in November....but the month just flew by! To top it off....Christmas is almost here. There is quite a bit of prep work needed for this holiday. Luckily there are plenty of sweet memories of Thanksgiving to carry me through the hustle and bustle of the season. The good thing about Christmas is it always comes whether we're ready or not. Here's a glimpse of our fourth and last Loose Feather pattern for the year 2012. It should be in your stores around Christmas time. Look for a free pattern soon....there was one we made for the booklet but due to lack of space we couldn't include it. Barb and I decided to offer it on the blog as a free pattern. Our web-site is getting a makeover. Hopefully there will be something to show there soon! 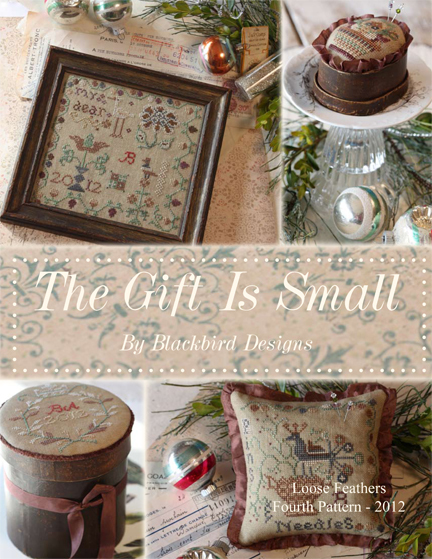 The cover looks wonderful, I love patterns for small items and gifts that I can make for friends. Your updates are always worth the wait. Love - love - love the new Loose Feather. Can't wait for it to arrive and to hear what you will be up to in the new year! Wonderful, love the patterns I look forward to stitching all the patterns. Sure will be happy to have a copy of the new book. I'll be looking for it! i love all of the designs so much.. 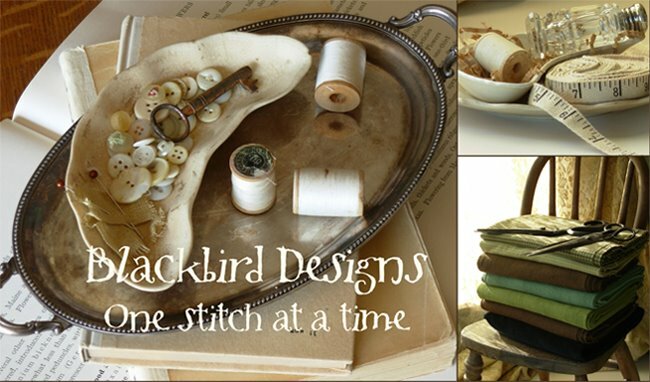 I think I speak for all Blackbird Designs "goupies"...we've missed you terribly! LOVE the new pattern! Can't wait for it's arrival! Wishing your and Barb's families a wonderful Christmas! Those 'small' gifts look just wonderful! Too sweet!!!! I've already emailed my LNS to pre-order my chart. It's so nice to see a post from you :-). The pattern looks charming. 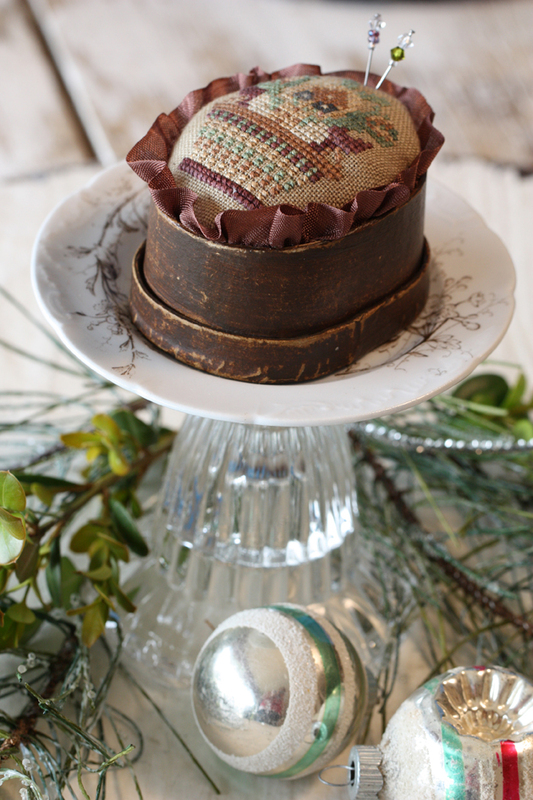 Wonderful you have a free pattern to share on the blog! oh I have missed hearing from you! The pattern looks fun...I need a lesson in stitching on linen...hard! How about the new quilt book? I was hoping to hear more about it soon. WHOOOO who! I am looking for to the new pattern and the free blog pattern. Nice to hear from you again. I am check your blogsite just in case. Love to read about your adventures. Don't be gone so long ... please. It's so beautiful! I love smalls and look forward to stitch these wonderful designs!! Love the new pattern! I also look forward to the freebie! I've missed your posts - you know the cookies, the bread, an update in the bees........glad to hear from you. The new Loose Feathers book looks wonderful (as usual)! Thank you for sharing...your stories, pictures and inspiration. OH AND FABRIC!!! And you made a Christmas tree out of the fabric squares. :) Merry Christmas! I was glad to see your post again - Love the new patterns - I was also wondering how the bees are. Love the newest fabric lines. So beautiful. Darling small patterns. I'll look for the booklet in my local shop! Glad to see an update to your blog. I look forward to them. Merry Christmas and thanks for a chance to win a prize! Love the new Loose Feathers designs and the fabric is, well, fab! I checked on Monday--I had not given up on you ! Sure missed your posts. Love the final pattern. Can't wait till in comes in the mail! A lass to late to enter for the give away. Wish you had given us a little more time on that one! But welcome back and Merry Christmas! The smalls are always the most fun! A fast sense of accomplishment! Can't wait until Market..What you ladies going to have for us in cross stitch? You shared very nice post.Thanks for sharing the great post.I like it. Very fantastic and well-written post.I read and liked the post. It,s beautiful.i love all of the designs so much..Thanks for sharing.